Camilo Jauregui taught percussion and conducting at the Afghanistan National Institute of Music from 2014 to early 2016. He is the founder and general director of the Banda Sinfónica Metropolitana de Bogotá, and is co-founder of Tocar y Luchar (‘To Play and to Fight’), run by Cafam (the Caja de Compensación Familiar, a foundation to help families and communities in Colombia) – the first and only El Sistema programme in his native Colombia. He has held residencies with the National Ballet of Cuba and the Banda Sinfónica de Cundinmarca (Cundinmarca being the Columbian state where the capital, Bogotá, is located). 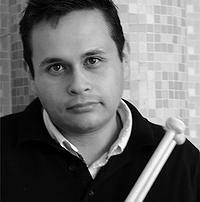 Camilo has written many compositions for percussion, string and wind ensembles and solo pieces. His book El Desarrollo de la Carrera de Percusión en Bogotá entre 1980–2005 (‘The History and Development of Percussion in Bogota between 1980–2005’) was published by Corpus, Bogotá, in 2007. Mr. Jauregui was conductor of Ensemble Zohra for The Rosegarden of Light.